CHICAGO, IL (6/23/16) – THE MISSION is pleased to present In Secret Unison, an exhibition of recent paintings by Chicago-based artist Cole Pierce. An opening reception will be held on Friday, July 8 from 6 to 8pm and will continue through August 19, 2016. 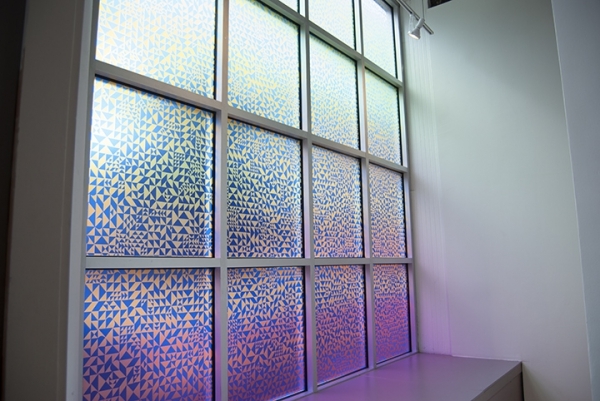 A site-specific window installation by Pierce will be on view on the gallery windows. 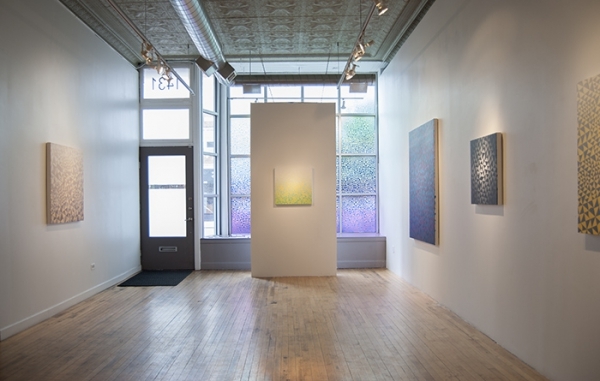 Pierce implements a relief painting process by taping off geometric-based grids and applying several bold gradients of acrylic. 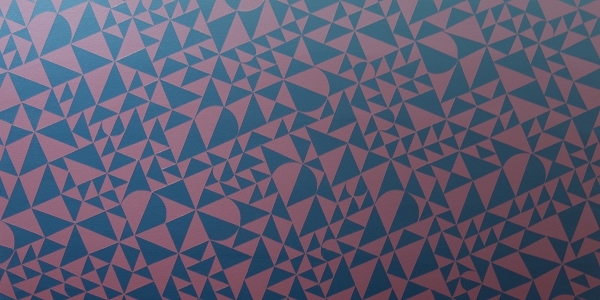 The tape is removed to reveal rigid layers of accumulated paint that have formed triangle-, square-, and circular-shaped patterning across the canvas. 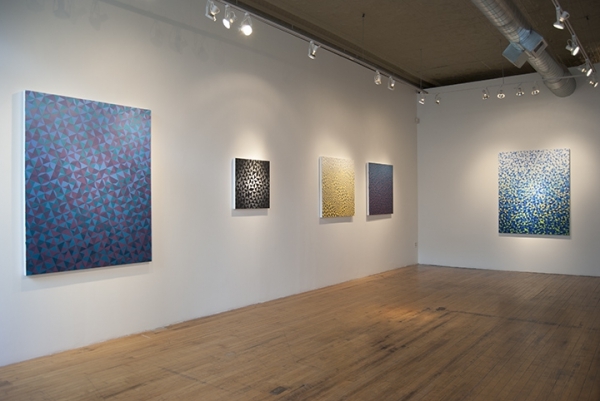 Although his use of geometry is informed by the Op Art movement of the late twentieth century, Pierce dedicates his practice to confronting the expectations of the errorless, measured precedent set by Op Art. Pierce’s subtle inconsistencies and evident brushstrokes violate this expected, calculated abstraction and lend itself toward a more unpredictable form. The interruptions circumvent the viewer’s perception and create a phenomenological experience by challenging the viewer’s ephemeral transition between comprehension and delusion. The masking by now is more or less flawless, but it is not without the occasional eruption or slippage, which is accepted for the most part. In fact, upon close examination, his paintings often point to the imperfect process of their making – modular and additive, rather than deductive and a priori – and to the unstable facts of their beholding, not to some ideal sense of order or balance (with all of its moral overtones). 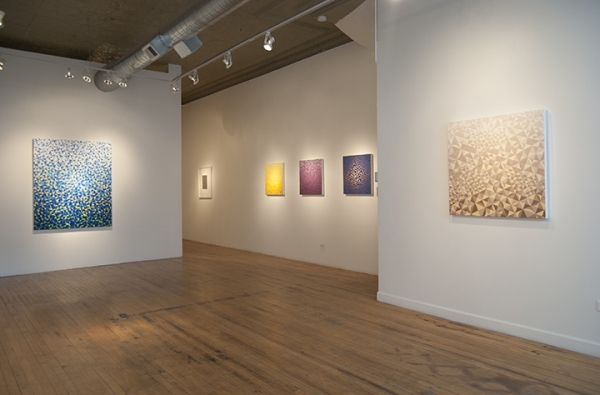 On the contrary – these paintings share with Op Art a belief in the destabilizing effects of perception itself. Yet they have as much or more in common with the nearly immaterial investigations of artist like Robert Irwin, Norman Zammitt and Robert Swain as they do with more matter bound painters like Bridget Riley and Victor Vasarely. A catalogue with an essay written by Steven Husby will accompany the exhibition and will be available online. COLE PIERCE (b. 1978) received his MFA from Northwestern University and received his BSS in Art and Sociology from Cornell College. He has recently exhibited at ROMAN SUSAN, Johalla Projects and Hinge Gallery. He received a DCASE (Department of Cultural Affairs and Special Events) grant in 2016 and is currently a SÍM (Association of Icelandic Visual Artists) resident in Reykjavík, Iceland. His work was included in Plane Figures, a group exhibition of geometric abstraction at THE MISSION in 2015. 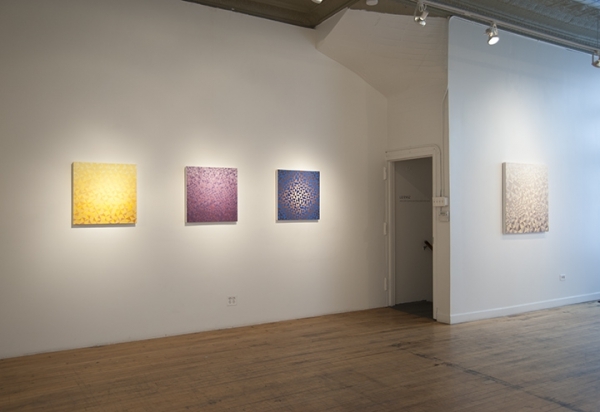 In Secret Unison is Pierce’s first solo exhibition at THE MISSION. He lives and works in Chicago, IL.